The University of Georgia Athletic Department and football digital and video teams caps off a very busy first week of January tonight when the Bulldogs face off against the University of Alabama Crimson Tide for the 2018 CFP National Championship Game. University of Georgia’s Mike Bilbow is overseeing the school’s video crew for tonight’s National Championship Game. 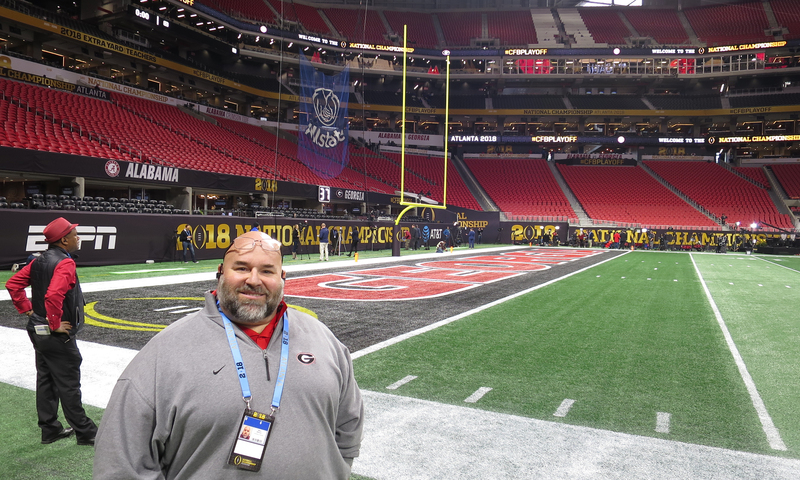 The game marks Georgia’s first return to a national championship game since 1980, and Bilbow and the team have been focused on making sure the current success takes precedence. The university has 10 people onsite in Atlanta for the CFP National Championship Game, including three editors who cut content via Adobe Premier (they also shot content), a social-media publisher, a producer in the press box, and five additional camera operators, two of whom are from the football team’s video crew. The championship game marks the end of a busy week that began last Monday with Georgia’s win in the Rose Bowl. The production folks returned to Athens, GA, where they focused on reports from the team’s practices on Thursday and Friday. Then, it was off to Atlanta for Media Day on Saturday and back to Athens again for a final practice. That said, there is still plenty of content being pumped out toGeorgia Bulldog fans, who, Bilbow says, are hungry for anything and everything, such as hype videos that inject some excitement into the buildup for the game. He notes that Eric Black, the recruiting video coordinator, has done a great job supplying content to the team and that Hannah Brinks, who designs graphics via the Adobe Suite of products, has made a difference across all the platforms. Fans, Bilbow adds, are consuming the content everywhere: on TV, digital platforms, social media, and a mobile app. Earlier today, the video team was out capturing footage from tailgates and the fanfest for a clip to be sent out to fans 90 minutes prior to kickoff. Tonight, the team of five shooters will be on the sidelines equipped with Sony A7, Panasonic Lumix, and a Sony FS7 camera with an 85-300 Fujinon lens. During the game, the editing team will be hard at work creating a highlights package that will be distributed to fans three minutes after the game ends.